As a Horseman, Bernie is renowned for not only his riding talents but for his teaching and coaching gifts. As a competitor, Bernie has represented the United States Equestrian Team both at home and abroad on many occasions and reached the top of the sport in all 3 of the International Equestrian Olympic disciplines: Show Jumping, Dressage, and Eventing. After amassing 60 years worth of training and riding techniques and experiences with thousands of horses, Bernie is driven to give back to the sport that has given him so much fulfillment and success. Experienced rider, trainer and barn manager grassroots through national level. Top Equitition and Hunter trainers at Sonoma Valley Stables. One of the most successful trainers of young, developing show jumping talent in the U.S. 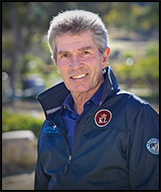 Owner of VS Dressage, Inc., a premier dressage training and riding facility in San Marcos, CA.